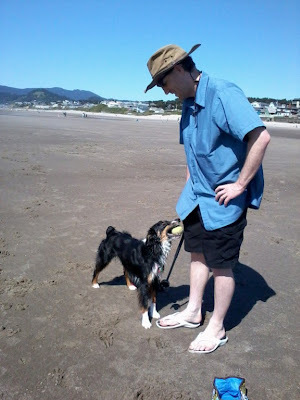 Have I ever mentioned the fact that I love Oregon's dog and beach rules! The fact that you can take your best friend to the beach is AWESOME!!!! At first Roxy was her little prissy self and didn't want to get into the water, until the ball was thrown enough times into it that she didn't care after a bit. I love this little smile on her face, she was having such a good time! The reasons that recall is the most important thing you teach your dog and makes it work the months of work to make it a constant reliable command!!!! Why does my dog pull on his leash?